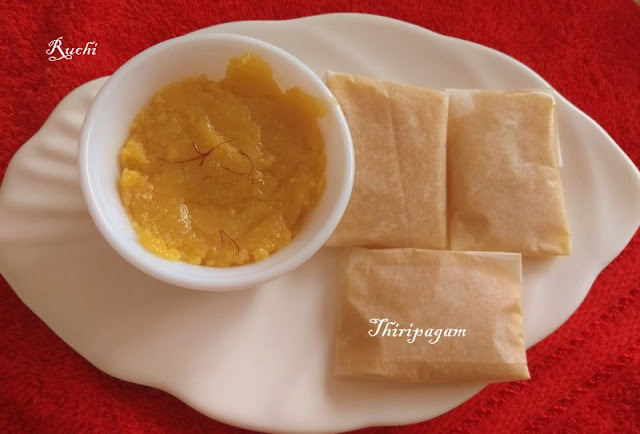 Over the years some of the traditional special dishes have gone out of fashion that are no longer found in our homes Tirunelveli is known for the delicious sweet "Halwa". But there are many forgotten recipe of sweets which was prominent in Tirunelveli, which is my native. I remember enjoying this special sweet called 'Thiripagam' during my teenage days. It used to be available in LALA sweet shops wrapped in a butter paper. This is one of the old forgotten recipes from Tirunelveli kitchen. but I wasn't clear about this recipe. while surfing I got this recipe from here and here. I tried this traditional sweet which is simply divine and scrumptious is a treat for your tastebuds! 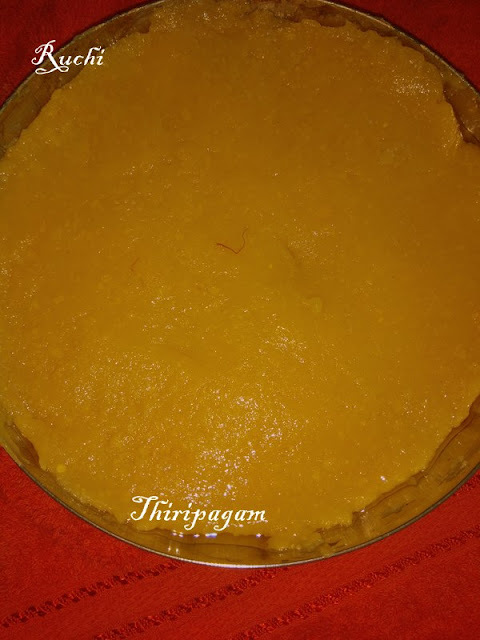 This sweet Thiripagam, – which means three parts, where the name must have come from the three main ingredients – bengal gram flour, ghee and milk. This sweet has an additional inclusion of milk to the besan with oozing Ghee which melts in your mouth within seconds. In addition to that Saffron and edible camphor that gives flavour and has an amazing aroma and makes this sweet unique. 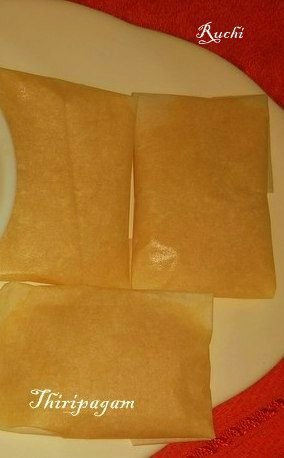 This dessert is shaped in rectangles or squares and wrapped in butter paper make this sweet elegant and graceful looking. This traditional sweet I bet these have to be everyone's favourite! Every spoonful of this yummy delicacy is a sheer delight for Diwali occasion! 2. In a bowl, mix the sieved flour, sugar, 1/2 cup clarified butter and milk with saffron – without lumps. 5.Add the soaked saffron milk. Start adding the ghee right from now at intervals. 6.Keep stirring till the stuff becomes thick like paste again. OnceIt will reach the right consistency and not sticking to the pan add the edible camphor and switch off the pan.